As the gaming industry expands, traditional computing architecture cannot keep up with gamers' demand for high-quality games. As the gaming industry expands, traditional computing architecture cannot keep up with gamers' demand for high-quality games. The rapid increase of Massively Multiplayer Online (MMO) games and mobile gaming means that cloud services are tasked with more and more support responsibilities as the backend servers for the games. Therefore, a reliable platform architecture is necessary to ensure stable system and business operations. 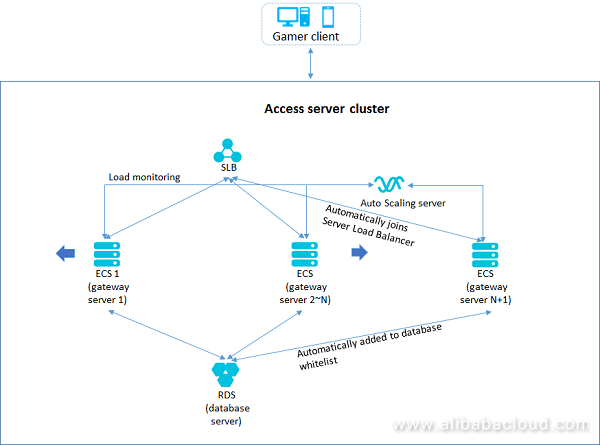 In this article, we will introduce Alibaba Cloud's solution architecture for MMO gaming applied to different scenarios. MMO games generally requires mutual real-time visibility between gamers on the same screen. Therefore, a large volume of movement and combat packets must be broadcast between users in real time. In this case, MMO game servers produce a massive amount of communication packets when many gamers are playing simultaneously. Therefore, the access layers of MMO game servers require ample network bandwidth and high network packet throughput. Mobile and webpage-based MMO often face massive spikes in traffic. As a result, game publishers requires maximum conservation and utilization of game server resources to handle bursty traffic. This is especially true for webpage-based games. For MMO web games, smooth gameplay between users means game publishers must increase the number of concurrent gamers in individual zones as much as possible. The maximum number of concurrent gamers in individual zones is generally required to be in the thousands. This feature can only be achieved with high server computing capability. MMO games generally connects users across different regions. Additionally, for mobile gaming scenarios, gamers are usually on the move. Therefore, game servers need to be dynamically allocated to the gamers to ensure smooth gameplay. 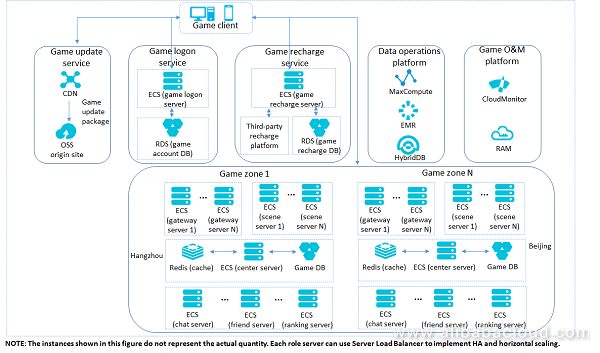 Alibaba Cloud's comprehensive suite of products provide solutions for all gaming scenarios, including game downloads and updates, game business servers, game logic servers, game database servers, and game data operations platforms to game O&M monitoring platforms. You can effectively improve O&M efficiency, enhance service experiences, and reduce total operating costs. 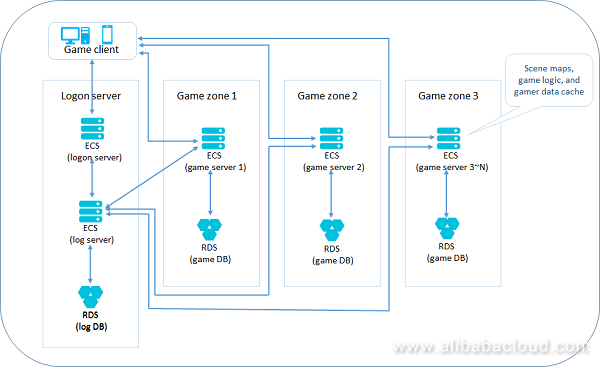 Alibaba Cloud's gaming solution uses products such as Object Storage Service (OSS), Content Delivery Network (CDN), Elastic Compute Service (ECS), ApsaraDB for RDS, MaxCompute, and CloudMonitor. The client connects to the gate server to initiate a login request. The gate server forwards the login request to the login server. The login server initiates an ID data verification query to the DC server. 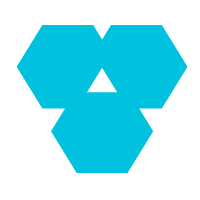 The DC server accesses the gameDB server to perform the data query and return the results. If ID verification is successful, the login server continues to query data and returns account status data (role, level, attributes, last login scene server, geolocation, and other information). It also synchronizes login status and information to the center server. The center server is responsible for distributing information to the corresponding scene server. At the same time, a gamer online notification is broadcast to the gamer's friends and the online gamer status monitor (to control reconnection after disconnection and disconnection time-out). After the gate server receives authentication information, it establishes a connection with the scene server, and the gamer successfully logs on to the scene server. If the gamer has public information to broadcast, a request is sent to the center server. The center server performs message packet broadcast. The scene server starts writing all user behavior to the log. At the same time, the relevant gamer data storage or query request is sent to the DC server. The gateway server is responsible for all network packet forwarding. Generally, the network load is concentrated here, so it has high network throughput requirements. The scene server contains the game logic and is relatively dependent on CPU power and requires a certain level of network packet forwarding capabilities. A single game zone serves over 10,000 gamers. The logic server generally divides gamers according to scene maps. Larger scales can be achieved by line division. The DC server caches gamer data and writes it to the database asynchronously. This ensures gamer clients can rapidly read and write data. It has high availability requirements, so it must use the application layer to implement data error tolerance mechanisms. The log server collects and processes all service behavior logs for a region. It has high disk write performance requirements. Generally, its function is implemented by grouping multiple servers. Compared to client games, mobile games have less complex gameplay and shorter lifecycles. Considering this feature together with operator policies and the resource economics model, mobile games usually adopt relatively simple deployment architectures. However, a minority of MMO mobile games use the client game deployment architecture. Clients generally connect directly to the game server. For a small number of games, a gateway is configured at the frontend of the game server or the gateway and game server are deployed on the same machine. Mobile games are relatively dependent on the CPU power and network packet forwarding capabilities of individual servers. A single game zone generally supports 1,000 - 5,000 online gamers. A dedicated game database server can be deployed for each game server, or a single game database server can be deployed for multiple zones. Using Auto Scaling, you can automatically scale up and scale down your access layer server cluster. This allows you to effectively cope with boot storms, battle event traffic peaks, and other scenarios, and ensure your server cluster resources have sufficient load capabilities. This solution also applies to login servers and other servers that require elastic scaling. A multi-level download retry mechanism ensures the high availability of downloads and updates, reducing the proportion of gamers lost during this stage. By splitting the back-to-source address and direct external download address, this solution avoids potential security risks from exposed addresses and Server Load Balancer unavailability. 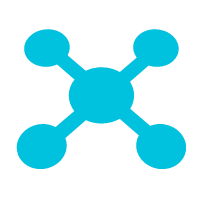 You can use rsync+inotify to synchronize files across multiple origin site servers in real time. A multi-level download retry mechanism ensures the high availability of downloads and updates, reducing the proportion of gamers lost during this stage. 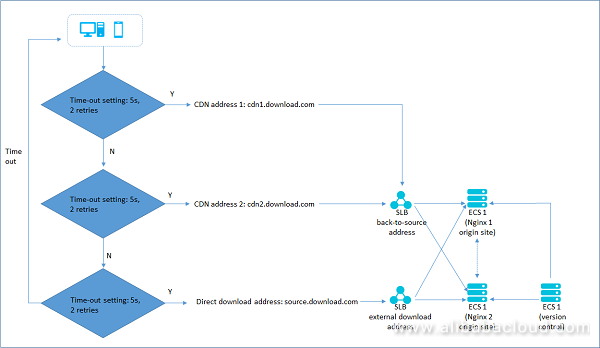 By splitting the back-to-source address and direct external download address, this solution avoids potential security risks from exposed addresses. By setting OSS as the CDN origin site and taking advantage of OSS's automatic remote replication function, it further improves origin site availability and throughput. 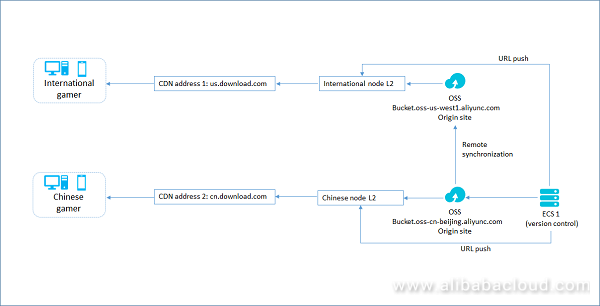 By deploying origin sites in China and abroad, this solution ensures high-speed and stable back-to-source operations. 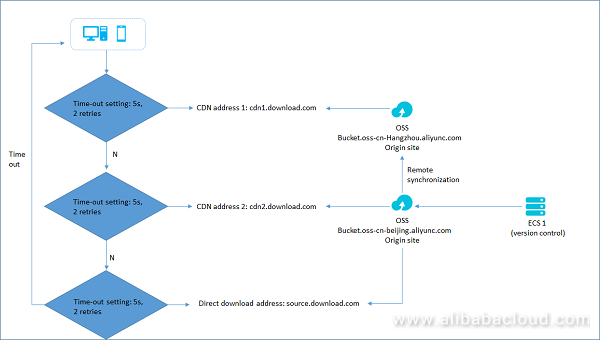 OSS's cross-region replication function automatically synchronizes origin site files. 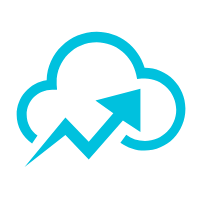 The URL push function pushes large files to L2 nodes, accelerating the speed of the first download and reducing the number of back-to-source requests. MMO games have always received a high degree of attention from the industry. Since the days of physical IDCs to the current cloud platform era, the MMO client games have evolved into mobile and web games, presenting developers with a host of technical challenges and opportunities for innovation. Alibaba Cloud provides top-level infrastructure and high-performance instances to meet the varying CPU computing power needs of all gaming scenarios. As the gaming industry develops, Alibaba Cloud will continue to refine its services and technology, providing customers with simpler, more stable, and more complete gaming solutions. 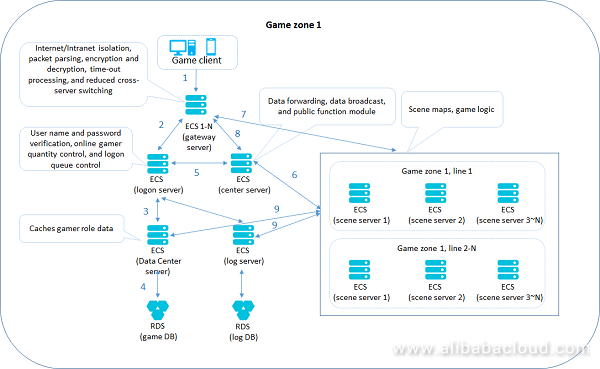 To learn more about MMO gaming architecture on Alibaba Cloud, visit the official MMO game solution documentation. Good one. Are the real-time Ray tracing Turing GPUs , HBM or GDDR5 ..... being used ? I believe without CDN, it is not good.